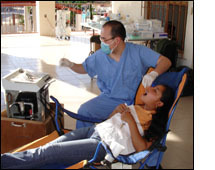 Through Acts Community Church, I participated in the Oaxaca, Mexico Dental Service Trip from March 17 to March 24, 2007. Our 5-day stay was in a village of about 1000 people called Santa Inez. Our team of 14 consisted of dentists, dental students, dental assistants and nurses. We provided a variety of dental treatments including fluoride treatment, adult prophylaxis, amalgam restoration, and extractions. The clinic was open from 9:00 a.m. to 4:00 p.m. and in total our team saw about 200 patients. The nurses checked vital signs and medical history while the dentists and dental students triaged the patients and provided dental services based on individual needs. The villagers were very open to our presence and grateful for the dental services because the nearest dental clinic was several hours away and many villagers can not afford dental work. It was gratifying to see patients who were suffering from dental infections be able to smile again. Having many of them come by the next day to thank us was an unforgettable experience. According to a local doctor in Oaxaca, dental treatment is one of the most needed services in developing nations. So I encourage other dentists to volunteer their time to treat and prevent dental infections in the people who need it most. Lastly, I would like to thank the Benjamin H. Josephson, MD fund and the director of Morristown Memorial Hospital Dental Clinic, Dr. Elizabeth A. Clemente, for supporting me on this dental service trip.